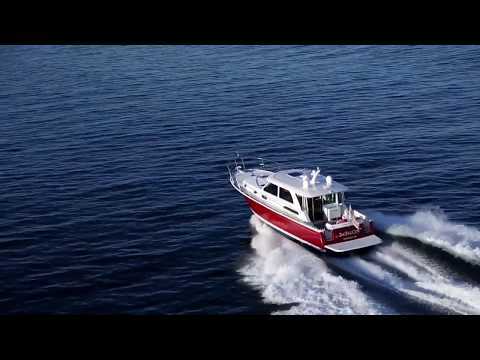 Over the last fifteen years the Sabre range of Salon Express motor yachts has reshaped the boating market. Unlike typical express cruisers which tend only to go out on those all-too rare ‘perfect’ days, owners of the Salon Express style can enjoy boating each and every day of the season tucked into the comfort and quiet of their yachts climate controlled interior. Now, Sabre presents the 45 Salon Express. An all new design offering two staterooms with two full heads. But her most unique proposition is the utility space located between the engine room and the guest stateroom. This space is reserved for the installation of optional accessories like a gyro stabilizer, washer/drier, additional freezers or wine chillers. By creating this working space, all storage areas within the vessel have been retained for their designed purpose. Custom tile in head and shower sole. Swing door at helm to starboard side deck.